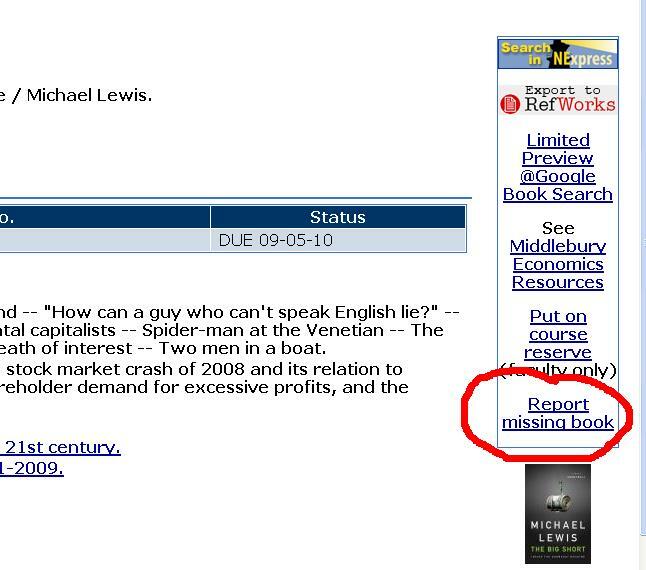 We have added a “report missing book” link to the right-side menu in MIDCAT. It opens up a web form which will be sent to Circulation for searching. This entry was posted in Midd Blogosphere and tagged Library Spotlight, MIDCAT, ★ The Essentials on July 21, 2010 by Dan Frostman. No MIDCAT in new library site??? Many researchers are surprised and dismayed that there’s no easy way to get to MIDCAT in the new library site. There is!!! If someone can’t find MIDCAT, they’re probably using Internet Explorer version 6. In IE 6, the “Library Quick Search” portal–with MIDCAT, articles, journals and more–displays at the bottom of the front page rather than at the top. We tested the new site on multiple browsers, but alas, this issue didn’t become apparent until after launch. We’ve reported the problem and hope for a resolution soon. If you can’t find MIDCAT, try scrolling down. Pass it on! This entry was posted in Midd Blogosphere and tagged LIS Website, MIDCAT, web makeover on February 9, 2010 by Carrie Macfarlane.